It makes sense that The Leisure Seeker was directed by Italian filmmaker Paolo Virzi in his English-language debut, because when you take into account its odd portrayal of American culture, not to mention its baffling and even offensive take on old age in general, this movie feels exactly like it was made by someone with a severe language barrier. Watching this movie is akin to seeing a space alien’s representation of life of Earth after only observing it for a day, because nobody in this film seems like a real person nor do they do things that anyone would logistically consider doing in the real world, especially how it handles such delicate subject matter as Alzheimer’s. It’s a pretty morbid sit, from its manipulative and treacly tone, to an ending that I personally found to be flabbergasting in its offensiveness. 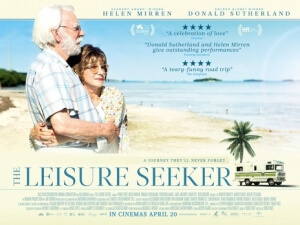 In the film, elderly couple John (Donald Sutherland) and Ella (Helen Mirren) head out together in their old RV, the “Leisure Seeker” of the title, for a trip from their home in Massachusetts to the Florida Keys, specifically towards the Hemingway House, since John used to be an English professor. However, they don’t have a whole lot of time as both are getting on a fair bit; John has Alzheimer’s, which this movie seems to repeatedly confuse with the type of short-term memory loss that Dory has in Finding Nemo, while Ella is stricken with cancer and is apparently refusing treatment for it. But none of those things stop them from getting into all sorts of predictable shenanigans along the way, a flat tyre and being held up by muggers being among them, as well as other not-so-predictable endeavours, like ending up at a Trump rally. Yes, you read that right; in one of the many bizarre decisions in making this film, Virzi decided to set his movie – which is based on Michael Zadoorian’s novel from 2009 – during the heated political climate of 2016, so there are scenes where extras are walking around wearing Trump or Clinton shirts and holding up respective signs, not to mention there’s television footage in the background showing rallies on both sides. It’s unnerving enough that this movie is reminding us of the rotten and troubled Presidential campaigns from less than two years ago, which right now is something that nobody wants to be reminded of, but what’s even weirder is that there is absolutely no reason for them to even be a part of this narrative. It never comes into play at any point, aside from that one scene at the Trump rally which lasts a few minutes at the most, and even then impacts the plot in no way whatsoever; you could honestly cut out each and every mention of Trump or Clinton from this movie, and nothing would be changed. Why Virzi decided to go with this time period to set this story in, when they could have so easily just stuck to a simpler contemporary setting, is anyone’s guess, because it turned out to be an extremely pointless addition to an already meaningless story. It’s just one of many instances where the film tries to pad itself out with episode after episode, because the plot of this movie is paper-thin and has absolutely nothing to say about anything, yet they managed to stretch it out to nearly two hours. There are entire sections of this film, not just the Trump/Clinton stuff but also entire sub-plots about their adult children worrying about their ailing parents’ journey and revelations about one of the couple’s past affairs, that again go absolutely nowhere or are resolved too fast to make much of a difference, but are only there just to give this movie some kind of meat to it. As a result, there’s barely any reason to care or get emotionally attached to this couple or the cross-country odyssey they’re setting out on, and it largely feels like you’re trapped on this journey with two elderly people who mean well, but you don’t really want to spend a lot of time around. Sutherland and Mirren are two great actors, and they are good in this movie despite the thin material they have to work with, but here they seem to have been directed in a way that makes their characters say and do things that nobody in any form of reality would even consider saying or doing, all the way up to an ending that I personally found to be rather insulting. Not to get too much into spoilers, but just take a look at the BBFC rating for this film and the reason why, and you’ll kind of get the gist of what this ending entails. The film concludes on a note it considers to be heartfelt and appropriate to the situation, but instead it gives off a message about old age that is very worrying and potentially dangerous to other elderly people who watch this and somehow be inspired. It hits me personally because I have a grandmother who has severe Alzheimer’s, and who like Donald Sutherland in this movie tends to forget entire conversations mere minutes after first starting them (though unlike this movie, my family and I don’t play it for laughs), and to see this film which essentially offers a get-out-of-jail-free card for geriatrics who are also suffering from things like Alzheimer’s and cancer, whilst telling them that it’s okay to do so and to not worry about the consequences, it’s just sickening. The direction of where this movie is headed is hinted at multiple times throughout the movie, sometimes unsubtly so, but it still came as a horrible shock when it actually came to pass, because never did I think that sitting down to watch a Helen Mirren and Donald Sutherland road trip movie would leave such a rotten taste in the mouth afterwards. I was quite disgusted with this film’s ending, as well as the film as a whole which despite the presence of two great actors still manages to be a trite and morbid experience that its target audience deserves far better than. The Leisure Seeker is a morbid, treacly and baffling failure that wastes two great actors in a thin and episodic plot with random and often pointless detours, and leads to a particularly offensive conclusion that will likely hit a raw nerve with anyone who has relatives in similar situations.